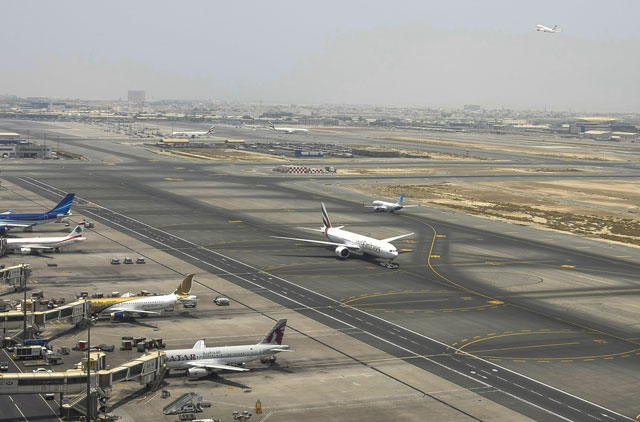 Dubai: Gulf Cooperation Council (GCC) countries must work together to find a solution to the region’s worsening air traffic congestion problem, a top aviation executive has warned. John Swift, Director of NATS Middle East, told Gulf News that investments into new airports by regional governments would go to waste if countries were not proactive in their approach to air traffic congestion. “We have to cooperate and we have to share precious resources in airspace so that solutions can be found. A lot of people will say it’s all very hard and very difficult and it’s someone else’s fault. But it’s actually about collaboration and everyone recognising … that aviation is an economic engine,” he said. The UAE, along with other governments in the region, are significantly developing their aviation industry with airport and airline expansions. Emirates, Etihad, and Qatar Airways continue to strengthen their fleet and many believe the three airlines will increase their fleet sizes later this month with announcements for new aircraft orders. But the expansion terminals and construction of new airports is not the only required infrastructure for the airlines. It is what’s in the sky. Dubai Airports were recently the first in the region to open its new Al Maktoum International airport at Dubai World Central. The new airport will be the largest in the world with an annual passenger capacity between 160 and 200 million. Despite the new airport having an operational head start on its counterparts in Abu Dhabi and Doha, it will still be impacted by the same congestion issues as its neighbours. “The issue is when aircraft are airborne it has to go through the same channels [as the aircraft from surrounding airports],” Griffiths said on planes taking off from Al Maktoum and entering the Gulf airspace. The infancy of the UAE’s aviation does however provide a buffer to the burgeoning industry with capacity still there to be declared. Griffiths said that changes in technology were also improving the efficiency of aircraft movements in the air. It does. however. appear that authorities are making some progress in addressing the matter. The UAE’s General Civil Authority (GCAA) has already taken some steps to lessen air traffic congestion. Last year, the authority restructured airspace with the creation of the Delta sector, which increased airspace by 55 per cent. Earlier this year, GCAA warned that air traffic over the UAE would nearly double by 2030. Currently, the GCAA’s Shaikh Zayed Air Navigation Centre located in Abu Dhabi manages more than 2100 air traffic movements a day. The aviation sector has planned an important role in the development of the UAE’s economy – essentially connecting the world through Dubai and Abu Dhabi. In an interview with Gulf News, Pablo Kang, Australian Ambassador to the UAE, highlighting the economic importance of that aviation industry, said that increasing air links between the UAE and Australia had traditionally been a big driver in bilateral links between the two countries. He said that flights between the UAE and Australia had increased by 35 per cent over the last two years. The development of the mega hugs in the region will have a strong impact on the amount of passenger and cargo traffic flowing into GCC countries but Swift said it was important for authorities and operators to have a holistic appraoch because of the run-on effect to other airports like Sharjah and Ras Al Khaimah. “If you only try and fix the problem at the immediate bottleneck, inevitably all you do is move the bottleneck further down the round. The issues that affect an airport in one country can actually be generated by another … because the airspace here [in the Gulf] is so small,” Swift said. Other nations and regions have faced similar challenges ,including the United Kingdom and Europe, who now operate under an open skies policy. London is home to Gatwick, Stansted, Luton, London City, and Heathrow airport, one of the world’s most important aviation hubs. Swift said London showed solutions could be found through collective agreements. “It requires a level of regional cooperation, it requires a level of cooperation among authorities across states and it requires a level of cooperation at the civilian and military level as well so all needs are understood,” he said. Unlike the United Kingdom, the UAE currently segregates its military and civil aviation airspace.